So I've had the urge to try a Mastery Bridge. More pic's and review if there's any interest. I know you won't want me to say this Dave, but surely the problem is the Bigsby? The break angle in inevitably going to be much shallower than on a standard Tele, & that has to affect tone, feel & string tension. A Jaguar bridge? Not one of Leo's best designs! I believe the favoured mod for a Jag is to fit a Mustang bridge, though I haven't tried it myself. How about one of the top loading Tele bridges? It's possible that the holes might be in the right position to allow the strings to run through to the Bigsby, & it should give you more authentic Tele tone. Just a thought from an ol' traditionalist. Thought you might say that Mike Well suppose it could be the Bigsby but I don't think so. The bridge design isn't that much better on a standard tele really. I did read about Mustang bridges modified by Warmoth being an option but I thought the Mastery bridge looked good. The bridge design isn't that much better on a standard tele really. It's a very crude piece of engineering, but it's rock solid & the strings are held down tight by the through body stringing. Just thought, does the bridge bit have to rock? I've got a Jag, but I could never get my head around how the bridge works. That new one looks like it's designed to go to war! Yes, the new bridge looks like it's built like a battleship. I'll try it at the weekend. Dave! 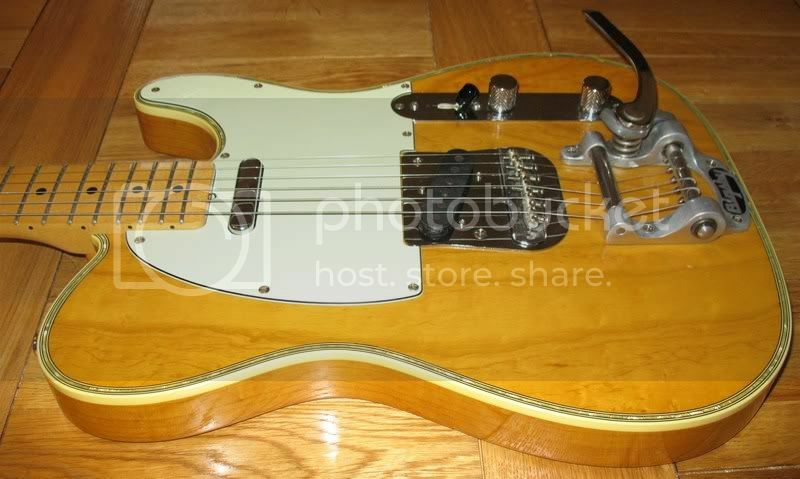 Do not modify that Tele to a normal Tele bridge, buy a regular Tele and I will buy that one! The Mastery bridge is the best piece of innovation I've seen in the guitar world for some time, and I hope it works well for you, but you wont have any trouble selling it if it doesn't work out. Most Jag/Jazz players are wanting a Mastery bridge. 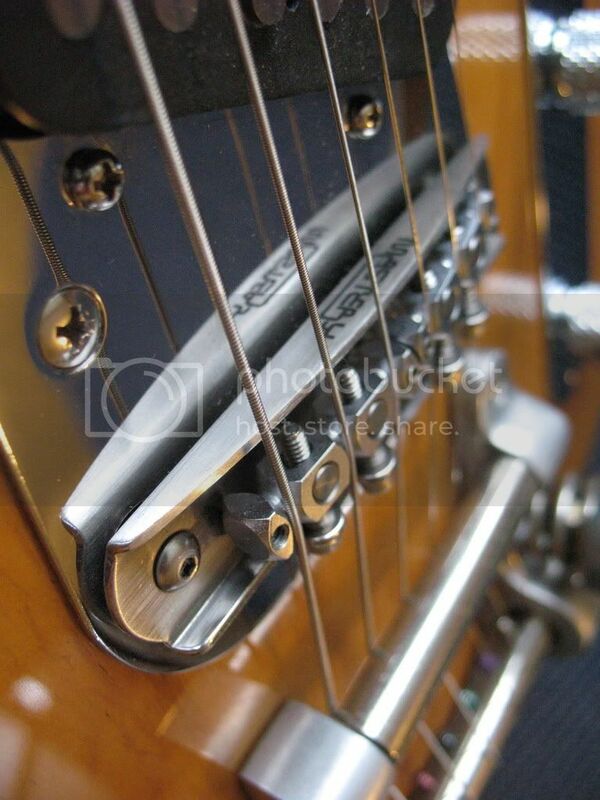 Having said that, I never had trouble with strings slipping off on my Jag with the standard bridge. A Tele with a Bigsby is an entirely valid guitar in its own right, it's not a Tele waiting to be fixed! Some love them, many don't..
After reading about this last night I decided to re-string my one Bigsby guitar - my 330. Thought it should be quick & easy to re-string it. Jeez - what a pain! Easily the most fiddly stringing job I've ever done. Are they all the same? Mine has some stumpy little posts on the Bigsby to slide the ball end onto - and it then promptly slips off when you try to slide the other end into the hole in the tuner. It ended up taking ages. 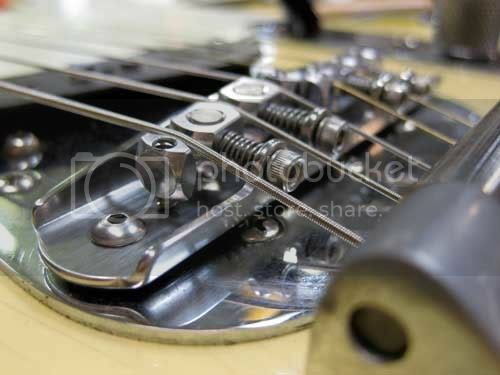 How easy is it to remove a Bigsby & fit a standard trapeze tailpiece? First time I did it I thouight the same but you need to make a little wedge or use something to hold the strings in place - then it's easy. A little wedge? How absurd! I ended up using blu tak. I don't rate Mr Bigsby much as a designer! I ended up using blu tak. Setting the bridge up so it sat flat on the baseplate. You can retract the screws back into the two shafts under the bridge. I used some aluminium tape wrapped tight around the posts so they fit snugly into the ferrules and prevented it from rocking back and forth. Adding a shim in the neck pocket, increasing the angle of the neck against the body, meaning the saddles had to be raised which brought the path of the string clear of the intonation screws and created a decent break angle against the saddle. It was fine after that, no need for a Mastery with the long wait and expense. As for stringing the Bigsby, just use a foam ear plug to keep the ball end on the post when restringing. Sounds like you've been there and bought the T-Shirt. Yes, it's currently a Jag bridge and I agree it's a poor design. I've alreadt got the masery bridge. It is pricey but looks like it'll work - will find out soon. I only had to wait about 2 weeks which is pretty good since I ordered it over the holiday period. Dropped right in using the the optional posts they ship. It works really well, much more solid and loads of adjustment. Previously the saddles and bridge were down as low as possible. Now there's plently of clearance to lower the action if I want to. Pretty easy to set the intonation too. Pricey but I'd certainly recommend to anyone with similar issues. I think it even sounds a bit better but that's probably just my imagination - it sounded great anyway.